How does Don Anthony Realty work? We’re full service real estate agents, so you really don’t need to do anything to sell your home with us. You can choose some of the marketing you want and how involved you want to be in the sales process. You save thousands with our low listing fees. We show your home to buyers, but if you end up showing your home to the buyer who buys your home (like to a friend or co-worker), you save even more! Your home will be offered to local Realtors® in the Multiple Listing Service (MLS) so they can show and sell your home. If they sell your home, you pay a low Don Anthony Realty fee and you pay the real estate professional that brings the buyer the fee you agreed to and quoted in the MLS listing. You will still save thousands. No matter how it sells or who sells it, you save! What advantages does Don Anthony Realty offer compared to a traditional Realtor® or For Sale By Owner? You get the exposure and support you can’t get as a For Sale by Owner and you save thousands by selling your home with Don Anthony Realty instead of with brokers who charge a 5%, 6%, or 7% commission*. You can use your savings to reduce the sales price, provide incentive options to the buyers, or offer an incentive to Buyer Agents who show your property, all of which will speed up the selling process. We let you choose exactly how much you want to participate in the sale of your home and exactly what services you need assistance with. Your fee is based upon how many services your Don Anthony Realty Real Estate Consultant provides. If you participate in the sale of your home and procure the buyer by either showing your home yourself or through an open house you hold, the cost to sell your home will be 45% – 95% less than a traditional listing agent! So why do so many people still list with agents charging 5%, 6%, or 7%*? The big real estate companies spend a lot of effort training their agents to push the “bigger is better” out-dated concept of their offering and try to avoid the issue of fees. To defend their traditional pricing structure, many agents will argue that “if you pay less, you will get less.” It’s all a smokescreen, of course, as we will put our advertising up against anyone. There is no shortage of unhappy sellers who paid a very high commission. Guilt – When sellers prepare to sell their home, they are immediately approached by neighbors, friends, family members, and acquaintances who are real estate agents who pressure the sellers to use them to sell their home. They want the seller to be fearful of damaging that relationship rather than compete on their actual services offered and price charged. Don’t fall for this! A true friend and valued relationship will want the best for you… even if this means using someone else to sell your home. Education – Most people do not realize that commissions are negotiable and rely on advice from a friend or relative in the real estate business. Many people think that For Sale By Owner or traditional agencies are their only options because information concerning options were not presented to them. Why do I need Don Anthony Realty? The #1 reason sellers use Don Anthony Realty is for our marketing & expertise. We counsel you on pricing your home, provide the marketing for your home to bring buyers with and without agents to your home, and most importantly, manage your transaction through closing to make sure that all of the activities and paperwork are done correctly and that all required legal documents are completed. We advertise your property extremely effectively. We use our exclusive marketing system to get you buyers. We advertise your home all over the Internet. We provide you “For Sale”, “Text-for-Info”, and directional signs. We discuss the “Bad” and the “Good” in all offers and negotiate to get you the best possible price and terms. We can help pre-qualify your buyer and help them obtain financing. We help you avoid problems, assist you if any arise, and work to save you money in all the hidden parts of the transaction. We coordinate with the contractors, appraisers, inspectors, and other professionals. We handle all negotiations, paperwork, contracts, any counterproposals, and manage your transaction through the closing. Yes! Many of our sellers were once buyer clients, and of course, many of our sellers also want to buy again. We also have buyer agents who specialize in working with buyers. What happens if a buyer calls Don Anthony Realty directly to request to see my home? A Don Anthony Realty agent will check the showing instructions to see if there are any special showing restrictions, and then schedule the showing. If the buyer is in the immediate area and wants to see the home right at that time, we will do our best to contact you to get the buyer in the house if it is convenient for you. How can Don Anthony Realty charge such low fees for its services? We’ve taken the traditional real estate model and turned it upside-down! Most agents only sell a few homes each year; but when a home sells, they make a lot of money. We do the opposite! We sell a lot of homes each year, and only make a little money when the home sells. Just like any “volume-based” business model, we are able to pass the high-volume savings on to you! We have streamlined the process of selling a home, giving you maximum exposure and support for minimum cost. If your business model is so beneficial to clients and you alike, why aren’t other brokers doing it? Traditional real estate brokerage is pretty entrenched, and industry change is slow. The Internet has really shaken things up, and changes are starting to appear. Large national chains are even starting to tinker with the traditional model; and along with Don Anthony Realty, there have been several companies taking a stab at discount brokerage. We expect that the rate of change within the industry will increase, bringing new choices to consumers. Instead of seeking to “jump on the bandwagon”, Don Anthony Realty is proud of doing “fee for service” from the start. Am I locked into a 6-month listing contract with Don Anthony Realty? No, you can choose a shorter time if you’d like, and you can cancel your agreement at any time before you are notified of an offer for just a small administrative fee. You can even come back to us to relist your property with no relisting fee at any time in the future! The MLS® (Multiple Listing Service) is the most comprehensive computerized database of homes for sale, with over 3 million listings nationwide. This database is used by Realtors® to market and promote their own listings and to cooperate with other Realtors®. A large portion of real estate transactions are a direct result of MLS exposure. By having your home in the MLS, it will be exposed to thousands of local real estate agents who otherwise would not have known that your property was for sale and would not have shown it. This is the same MLS used by a traditional broker who would charge you a full cost listing commission. REALTOR.COM is a leading Internet site where buyers can search for homes. It is basically the public version of the MLS. Technically, it is the official Internet site for the National Association of Realtors®. REALTOR®.com’s 3 million home listings are provided by participating REALTOR® Multiple Listing Services. This is one of the advantages of listing your home on the MLS – your home will then be copied to the REALTOR®.com web site and will be accessible to individuals and Realtors® via the Internet. What is “fee for service” or “á la carte services”? “Fee for service” is where the full service package is separated into any number of component parts and combinations. In this arrangement, different services cost different fees, and these fees are usually not contingent upon the property selling. Our fee structure provides you “full service” to meet your needs, while saving you as much money as possible. Most real estate professionals refer to their service as “full service.” This means that they do everything they think will sell your home: place it in the MLS, advertise it in various places, show your home to potential buyers, handle the negotiations when you receive an offer, and handle everything through closing. The question really should be, “What is full-cost service?” Sadly, some agents (regardless of company size and brand name) advertise homes in the MLS and wait for a contract to come in with no service provided beyond that. Many times after these listing agreements come to an unsuccessful end, we end up speaking with these unhappy sellers, and we explain to them what we do. Most clients realize they are getting more services than when they were paying a much larger commission. We offer you a menu of services that lets you choose as much or as little service as you desire, AND we back it up in writing by making the specifics of the service and the marketing we provide part of the listing agreement! Some brokers just put you on the MLS with 1 to 3 pictures, and that is it. If a broker doesn’t help with contract negotiation and certain other aspects of the transaction, the MLS considers the listing to be a “limited service” or “entry only” listing. The MLS requires the broker to disclose the type of services they are providing on the MLS listing so buyer agents know they may have to do more work than if they were dealing with a “full serivce” firm like Don Anthony Realty. Are you a “discount” broker? All real estate commissions are negotiable and there is not a specific commission that all brokers charge. Due to our low fee structure, many would consider us a Discount Broker. What makes Don Anthony Realty unique is that we are a “fee for service” company. We have determined a very competitive fee for each component of a real estate transaction, and we offer that to the public in a “no haggle” environment. Unlike traditional real estate, you don’t have to argue and bicker with us to get a super competitive rate! We don’t attempt to make a fortune from each family we deal with; we just sell a lot of homes and pass along the savings to you. We will help you determine an appropriate price for your home. If you would like, we can provide you with a Comparative Market Analysis that will give you information regarding the price range of similar home sales in your area so that you can choose a price you feel is appropriate for your home. Will a yard sign be provided? Yes, an attractive Don Anthony Realty yard sign, as well as directional signs, will be provided that is conservative and does not indicate a low cost or alternative listing. We believe a professional and discrete yard sign like ours yields better results than having a “For Sale By Owner” or similar sign. What are open houses? Are they necessary? Open Houses are typically conducted on Saturdays and/or Sundays. The idea is to let the buyers preview your home in a no-pressure, non-scheduled manner. Open Houses statistically are responsible for around 2% of all home sales, so they typically don’t get your home sold. Just like “location, location, location” is important, so is “exposure, exposure, exposure”. The more people that see your home, the more you increase the odds of finding a buyer. Since opening your home to others does not require a real estate license, unlike a lot of other agencies we allow you to do your own open houses and save the buyer’s agent commission. We work all day. Will you show our property? We will negotiate the contract and handle the transaction through to Closing. Due to our high volume business, we negotiate many more contracts than most agents do, giving us the experience and expertise necessary to represent our clients in the best way possible. Since there are contract changes all the time, it’s important to have someone on your side of the table that knows what they are doing rather than an agent who has only sold a few homes. Our experience gives our clients the edge necessary to get from “just listed” to “sold”! How does Don Anthony Realty help me with the paperwork and legal steps? 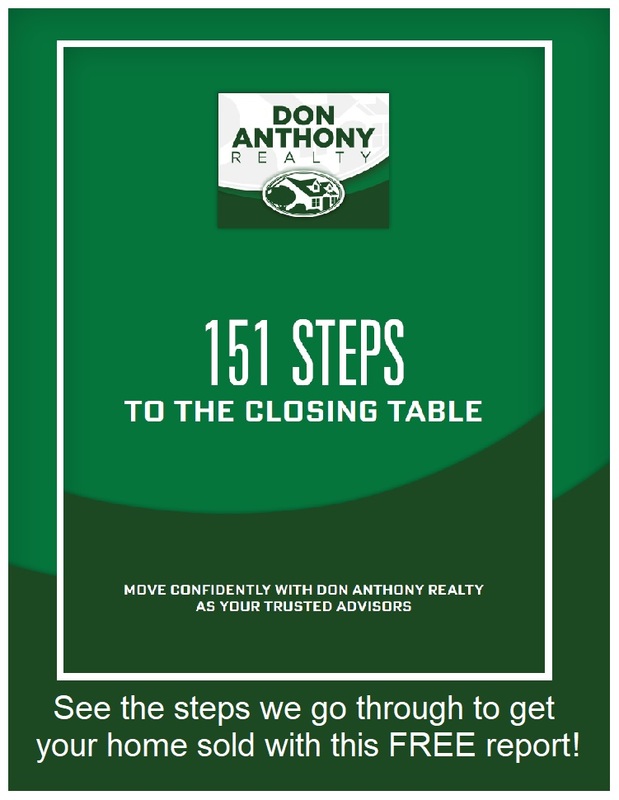 Don Anthony Realty’s licensed consulting team will help you execute your transaction through to closing. Once a buyer for your home is found (either directly or through a buyer’s agent), one of our licensed Real Estate Consultants will assist you with the the purchase agreement and all the steps to closing.Don Anthony Realty’s licensed consulting team will help you execute your transaction through to closing. Once a buyer for your home is found (either directly or through a buyer’s agent), one of our licensed Real Estate Consultants will assist you with the the purchase agreement and all the steps to closing. What if I sell my home myself? If you sell your home yourself without a buyer’s agent involved, no Buyer’s Agent commission is due. The only fee is the Don Anthony Realty fee, which is collected at closing. If another agent contacts me directly to show my home, do I have to give them a commission if they write a contract? Yes, since your home is listed in the MLS through us, then you are legally bound to pay the real estate professional that procures a buyer for your property the amount of commission defined in the MLS listing. May a buyer contact me directly after a Realtor® shows my home to them? Yes. However, you will still be obligated to pay a selling commission to the Realtor® who showed the home. How much commission do I have to pay? Unlike most real estate agencies, we offer several options to list your home—we are leading the trend within the real estate industry to charge a “Fee for Services Provided.” You decide how much you want to participate in the sale of your home and what services you would like your Don Anthony Realty Real Estate Professional to provide. Many of our clients choose to use one or two added optional services, but you can successfully sell your home with us for only 1.49% when sold or choose $499 up front and 0.79% when sold. If there is a buyer’s agent involved, you will also pay the buyer agent commission you agreed to pay. No. Don Anthony Realty identifies all fees up front. If Don Anthony Realty brings me a buyer who buys my home, then will I owe a commission to them for bringing the buyer? If a Don Anthony Realty agent brings a qualified buyer to you who purchases your home, we are entitled to the buyer agent commission for selling your home if we show the home to the buyer. This is the same as any other agent who brings a buyer. Won’t buyer agents boycott my listing? No. Buyer agents are indifferent as long as they are being paid their due. Our listings have been sold by nearly every major real estate company in the area, and we have excellent relationships with our colleagues. In addition, it is a violation of the Sherman Antitrust Act for an agent representing a buyer to choose which listing to show or not show based on the fees you are paying to us. No agent wants to lose their license, lose their livelihood, and go to jail. How do other Realtors® show my home? Other Realtors® will schedule a showing through a contracted appointment scheduling service. Will my listing look the same as those who have agreed to pay a full listing commission to a traditional agent? Yes. Since your listing is a “Full Service” listing when listed with us, it will be identical to those paying a much, much higher fee.